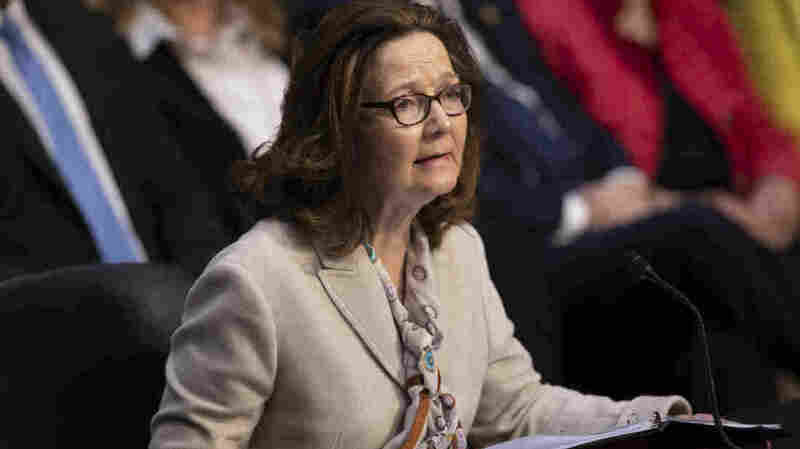 Gina Haspel: CIA Should Not Have Carried Out 'Enhanced Interrogation' : Parallels The nominee to be CIA director makes her remarks in a letter that brings immediate support from three Democractic senators. She now appears to have sufficient backing to win Senate confirmation. Gina Haspel, the nominee to be CIA director, testifies at a Senate intelligence committee hearing on May 9. Haspel now appears to have enough Senate support to win confirmation. The nominee to lead the CIA, Gina Haspel, said in a letter that the spy agency should not have undertaken a harsh interrogation campaign, which included waterboarding terrorism suspects, following the Sept. 11, 2001, attacks. Shortly after her letter became public Tuesday, three Democratic senators announced their support for Haspel, effectively ensuring that she will be confirmed as the first woman to lead the CIA. At her hearing before the Senate intelligence committee last Wednesday, Haspel said she would not initiate any new detention and interrogation program as CIA director. But in several sharp exchanges with Democratic senators, she did not disavow the previous program, from 2002 to 2008, in which she took part. In a letter to Sen. Mark Warner, a Virginia Democrat on the intelligence committee, Haspel wrote, "With the benefit of hindsight and my experience as a senior agency leader, the enhanced interrogation program is not one the CIA should have undertaken." The letter was dated Monday. Shortly after it became public on Tuesday, Warner announced he would be backing Haspel when the intelligence committee votes on her nomination Wednesday. "I acknowledge that this has been a difficult decision," Warner said in a statement. But he added, "I believe she is someone who can and will stand up to the president if ordered to do something illegal or immoral — like a return to torture." Warner was among the Democratic senators on the committee who grilled Haspel last week over her role in waterboarding and other harsh tactics. Haspel ran a black site prison in Thailand in 2002 where waterboarding took place. Three years later, when she was based at CIA headquarters outside Washington, Haspel wrote a cable calling for videotapes of the waterboarding to be destroyed. In addition to Warner, Democratic Sens. Heidi Heitkamp of North Dakota and Bill Nelson of Florida also announced their support for Haspel on Tuesday. This brings the overall count to five Democrats. Almost all Senate Republicans are likely to vote for Haspel. The full Senate is expected to vote next week, and Haspel now appears to have sufficient support to win confirmation, replacing Mike Pompeo, who has become secretary of state.